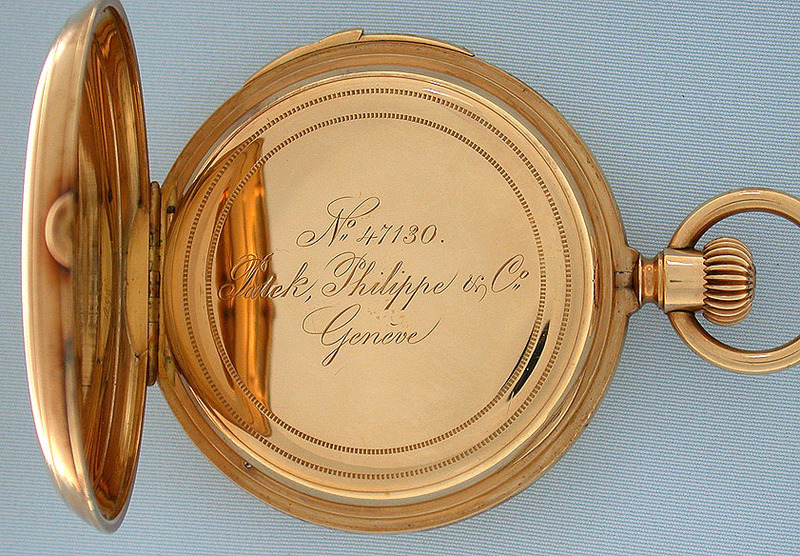 Fine Patek Philippe 18K gold hunting case minute repeater antique pocket watch with royal and celebrity provenance, circa 1871. 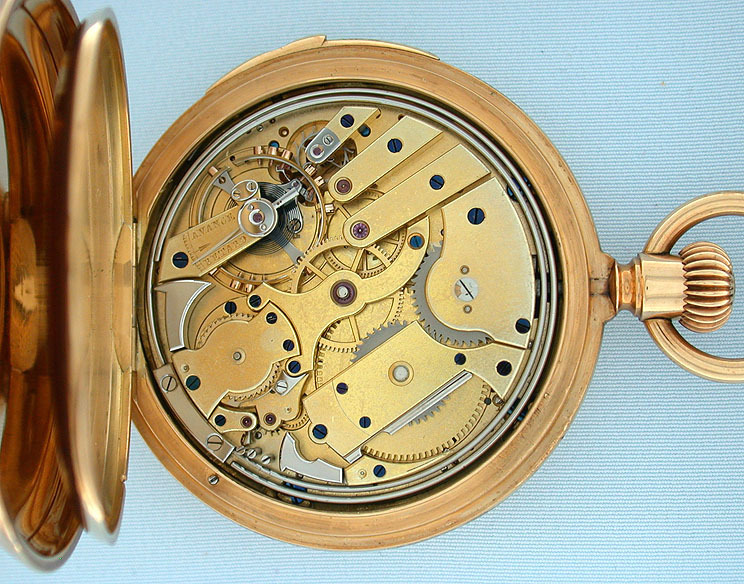 This is is one of the earliest Patek Philippe hunting case minute repeaters known to exist to date. 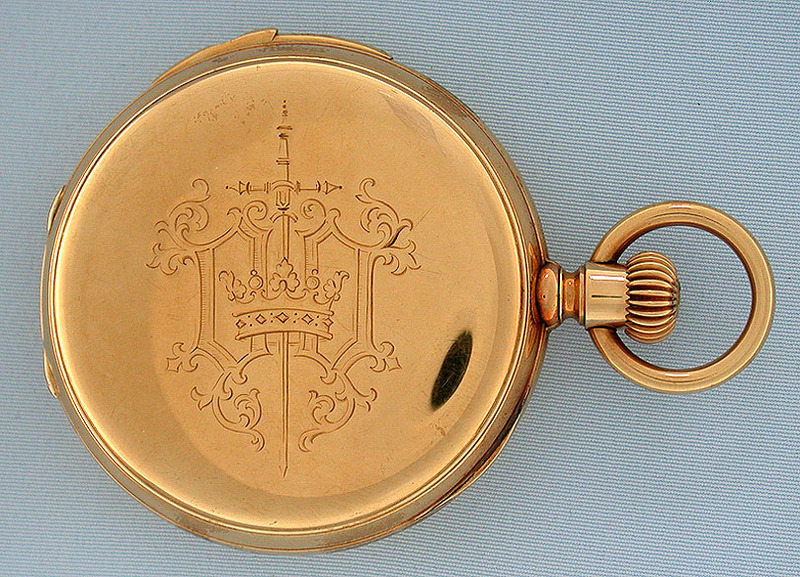 Plain polish case with coat of arms engraved on the cover and slide in the band to activate the repeater. White enamel dial with blued steel hands. Gilt 24 jewel movement with wolf's tooth winding. When activated, this watch chimes the exact time using different chime tones to designate the hours, quarter hours, and minutes with loud clear chimes. 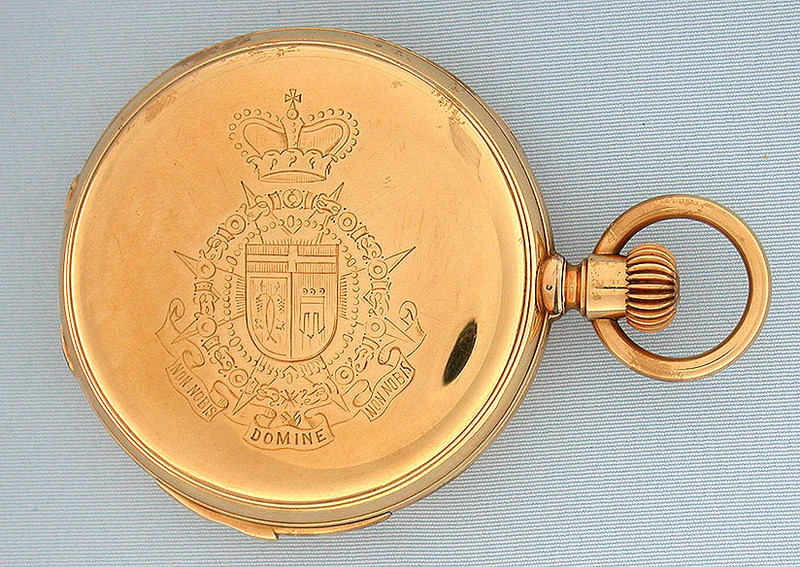 The cover of the watch is engraved with the coat of arms of the Lichnowskij family (also spelled Lichnowsky) which was made Bohemian counts in 1727, Prussian counts in 1773, and Austrian princes in 1846. Members of the family included Prince Carl Lichnowsky (1761-1814), patron of Ludwig van Beethoven; Prince Eduard Lichnowsky (1789-1845), author of "History of the Habsburg Dynasty", Prince Felix Lichnowsky (1814-1848), the patron of Franz Liszt, and Count Robert Lichnowsky (1822-1879), the Canon of OlmŸtz (Olomouc in the Czech Republic). 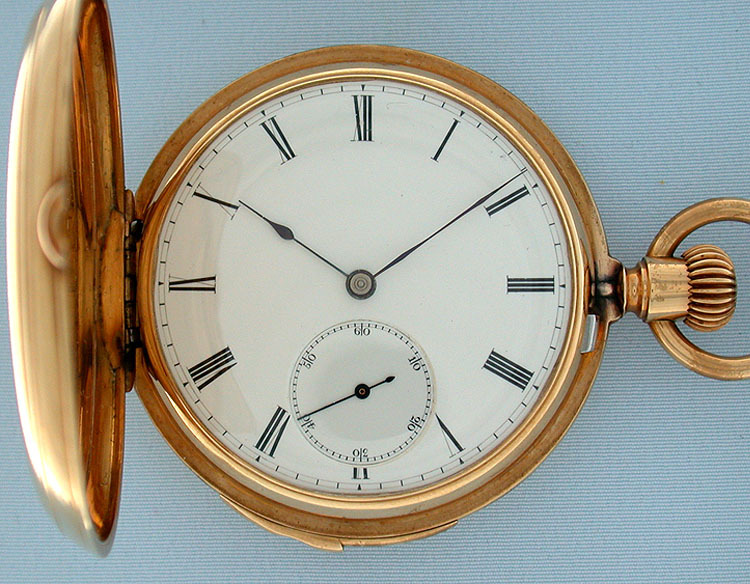 Since the Lichnowskijs were enthusiasts and patrons of classical music, It is assumed that the watch was given to Leo Slezak, and then to his son, Walter Slezak. Leo Slezak was a tenor with the Vienna Opera and then the New York Metropolitan Opera. His son Walter was a famous actor appearing in more than 100 films and also in numerous Broadway musicals. 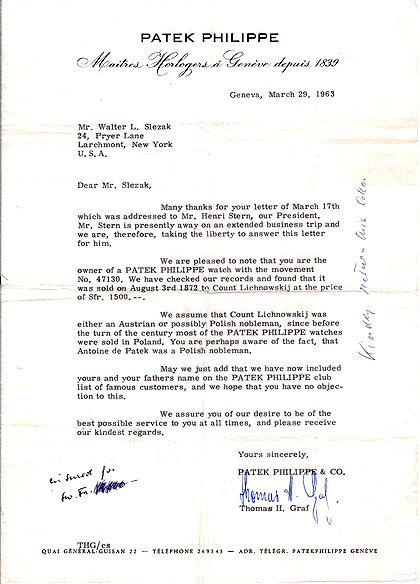 The watch is accompanied by copies of correspondence between Walter Slezak and Patek Philippe who confirm that the watch was sold to Count Lichnowskij in 1872 and stating their interest in purchasing it for their museum. 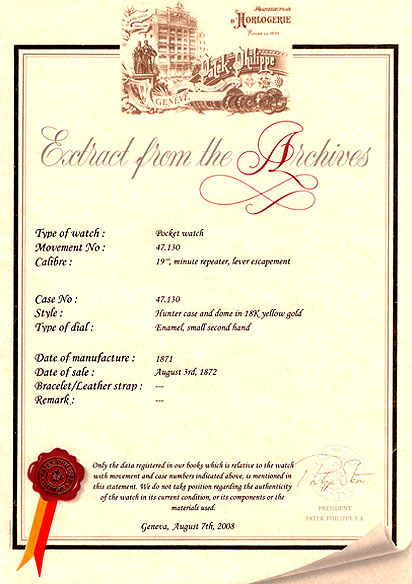 Also with certificate from Patek Philippe. Copies of additional correspondence available upon request.